OUR TORTILLERIA DEPARTMENT has customers coming from all parts of El Paso for our flour tortillas made daily, that speaks for itself! Produced by a husband & wife team since 2008, the quality is consistent & the taste is like your Mom’s best! 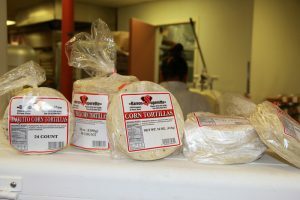 Try our corn tortillas hot & fresh. We store them in an ice chest daily to keep them nice & hot. Our tostada chips are delicious and certainly a must for your parties and for dipping in your chili con queso. The bags are sold in 1lb-5lb-8lb packages. All made Mexican style!